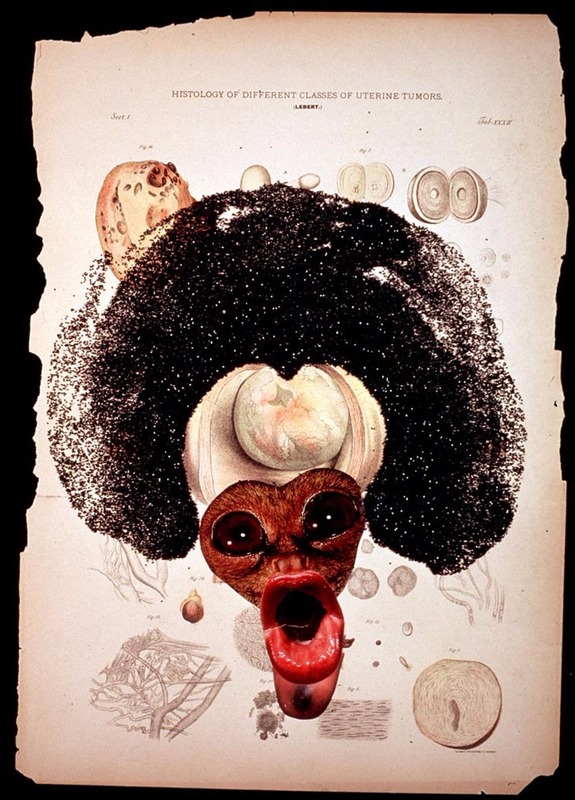 In Histology of Different Classes of Uterine Tumors, Wangechi Mutu readily confuses epidemiology with anthropological classification. Mutu satirically identifies her ‘disease’ as a sub/post-human monster, an equally primitive and prophetically alien species. Repulsive and ludicrous, Mutu’s figure is also controversially attractive: its fur face and stardust afro an epitome of funkadelic chic. Histology… embodies a notion of identity crisis, where origination and ownership of cultural signifiers becomes an unsettling and disputed terrain.